Players receive personal face-down cards, and share face-up community cards with other players. Blinds are posted each hand to open the betting, and play proceeds clockwise from the dealer. Players receive personal face-down and face-up cards, and no community cards are shared. A forced bring-in opens the betting each hand. In following betting rounds, play proceeds clockwise from the player currently showing the strongest face-up cards. Players receive personal face-down cards, then discard and draw replacement cards one or more times. Should the entire deck be dealt, discards are reshuffled to provide additional draws. In a mixed game, more than one poker variant is played in sequence, with the game changing round by round. The game variant currently in play is displayed on the table. 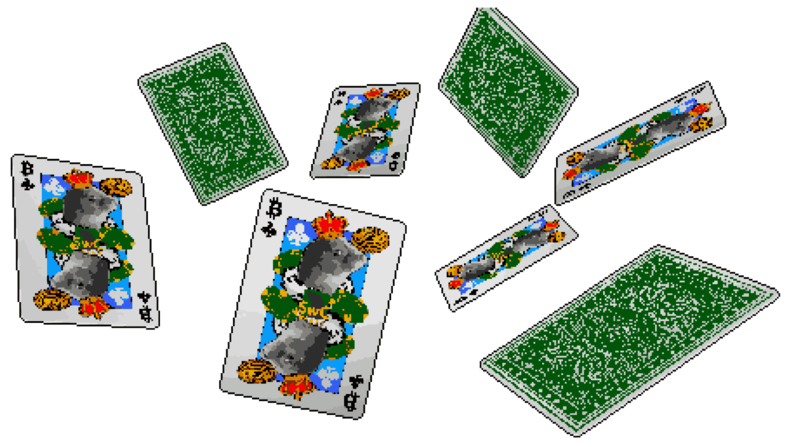 Players receive personal face-down and/or face-up cards, arranging them on a layout to form two 5-card hands and a 3-card hand. Players set their cards in turn, clockwise from the dealer. There is no betting or folding. Instead, points are won or lost at the showdown of each hand. After a round of hands, points are settled by exchanging chips. The amount of a bet is fixed at a particular value. Players may only bet or raise by one amount. The displayed stakes represent the small bet and big bet. The forced bring-in bet in stud games, and the forced small blind in flop games, are a discounted amount lower than the small bet. All other bets are equal to the small bet or big bet. For the first 2 betting rounds, the amount of a bet or raise is a small bet. In following betting rounds, the amount of a bet or raise is a big bet. In a hand containing 3 or more players, as well as in a tournament, a maximum of 1 bet and 3 raises are allowed each betting round. In a hand containing only 2 players, the amount of raises allowed each round becomes unlimited. A player without enough chips to raise the full bet may go all-in for less and wager all remaining chips. An incomplete all-in of half the bet or more counts as a raise. An incomplete all-in of less than half the bet is not counted as a raise. There is no maximum limit to the size of a bet. Players may bet or raise from the minimum up to a maximum of their entire chip stack (all-in). The displayed stakes represent the small blind and big blind. At the start of each betting round, the minimum bet allowed is the amount of the big blind. A player who is facing a bet and wishes to raise must raise by at least the amount of the bet. A player who is facing one or more raises and wishes to raise again must raise by at least the increment of the last raise. Players may bet or raise up to their entire stack at any time. A player without enough chips to raise the allowed minimum amount may go all-in for less and wager all remaining chips. An incomplete all-in is not counted as a raise. The maximum amount of a bet is the size of the pot. Players may bet or raise from the minimum up to a maximum of the total pot. Players may bet or raise up to the size of the pot at any time. The total size of the pot includes all bets and calls from the current betting round. A player without enough chips to raise the size of the pot may bet or raise their entire stack all-in. The displayed stakes represent the chip value of 1 point. At the showdown of each hand, players win and lose a number of points to each other. These numbers are totaled and tracked during the round. After a round of hands completes, players settle the final total of points won or lost, by exchanging chips with the other players in turn. A player may not exchange more total chips than he had in play at the start of the hand. Should a player win or lose more points than this total during an exchange, the maximum amount is exchanged instead.